In the final post of this mini-series I’ve moved on to a more intermediate piece of coding. This was actually my favourite project of all the C++ tutorials. Visually it was the most interesting, and actually implied a cool little game. I quite like the idea of designing Burning Monkey Ball Deluxe. It’s a higher stress, higher risk version of Monkey Ball with dire consequences for failure. Another day, maybe. 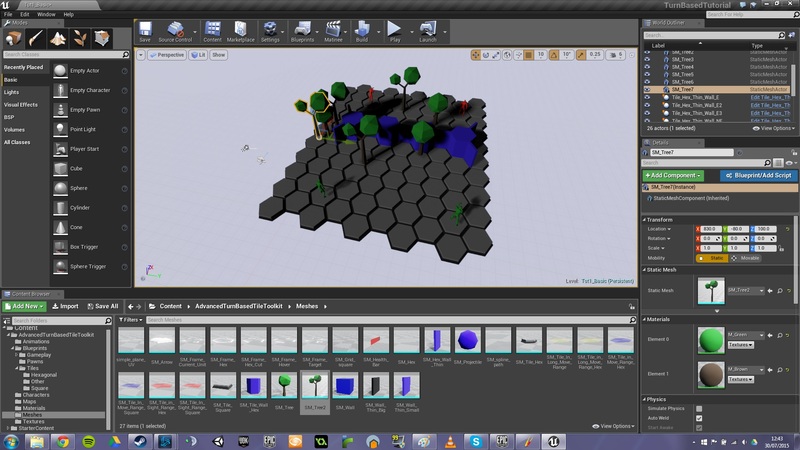 I think that Epic continues to do an amazing job with its tutorial content for Unreal 4. The C++ tutorials are as good as any I’ve used and offer some really interesting tasks to sink your teeth into. This tutorial builds an interesting camera systems which allows players to rotate around and zoom into a static mesh. It’s very much a third person game camera, but just using it evokes the feeling of an adventure or detective game, where the player is moving through an environment, searching for clues, and zooming in on areas of interest. Having spent a good deal of time in recent weeks working with Unreal 4’s Blueprint system, I now feel like I have a pretty solid handle on the basics of that system. Also, by looking into the guts of Advanced Turn Based Tutorial (LINK), I feel like I’m getting a better understanding of the potential of that system. However, I wanted to get a better understanding of how C++ works in Unreal. This desire came about for one main reason; in a professional setting it is not possible (and not sensible) for me to rely on blueprints all of the time. It is important that I’m able to, at a minimum, be able to parse code and make changes to key variables in order to tweak and tune my prototypes. Over the next couple of weeks I’m going to post a few times about C++. My aim is to complete some available tutorials, then play with variables in order to see what effect I have and further understand the way that C++ classes work in Unreal. This is going to be a short post that relates to some of the experiments I have been doing recently with an indoor zombie level and an outdoor zombie level. Long story short, the first experiment was the indoor level, where the zombies were massively powerful, both because their inherent stats (health, damage, etc) and because the nature of the level (tight corridors and short sight lines) gave the melee heavy hitters a huge advantage. 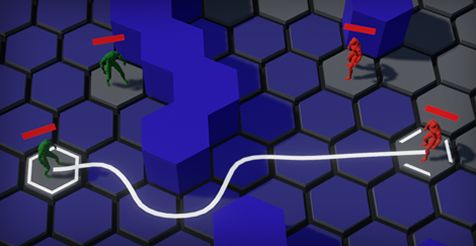 To compensate for that, I made an outdoors level with enemies spread further apart, with longer sight lines and a variety of low walls for the player to use as cover. The thing is, that didn’t help very much. After my indoor zombie experimentation, where the ranged player characters were overwhelmed by beefed up melee enemies who could take advantage of short sight lines and swarm the player, I decided to take the action outside. The new level design would have the immediate, but somewhat tough to measure, effect of rebalancing the game in favour of ranged heroes who can now use the full benefit of their greater range. With the game already rebalanced in favour of the player I now have a better space to start tweaking range/damage/health variables to get the levelling behaving as I want. 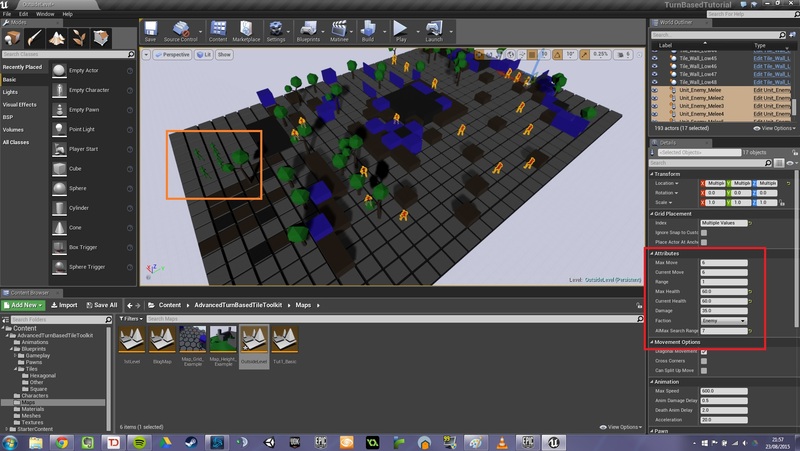 As I mentioned in a previous post, I’m going to be using the Advanced Turn Based Toolkit (available in the Unreal Marketplace) as a base to prototype out different mechanics of my turn-based zombie game. I know at this point I must sound like a salesman for this particular toolkit, but I just love the way it is put together. The best aspect of the toolkit is just how easy it is to customise. I wanted to put together a small, basic map to see how the different characters (a ranged character and melee character interacted). First, I set out a hex grid and placed a couple of characters. See image below. This isn’t the blog post I promised but, whilst starting to put together my turn-based idea, I stumbled onto something that made me think about one of the big differences between UE4 and UDK. When I used UDK, the Content Browser was a faithful friend. It wasn’t overstocked with meshes and objects but there was enough there to let you throw together an aesthetically interesting level without too much trouble. A far from profound, but certainly noticeable, adjustment to using UE4 is the bare cupboard of a content browser. It took me a while to understand that, simply, the free content from UDK’s default content browser had been replaced by a shop. My default reaction, predictable, reasonably, was to be a bit put out. Swapping my free things for expensive things hardly seemed like a good deal. As is often the case (and with the help of a friendly “thank you subscriber, we’re free now” voucher) I was able to see the benefits of the new marketplace.